For the youths of Gurgaon, a wealthy suburb of New Delhi known as ‘Millenium City’, Prison nightclub is a Shangri-La of cheap booze, gyrating young women and pumping Punjabi pop. But before the waxed and preened sons of India’s middle class can gain entry to this earthly Paradise, they have to pass through a wall of muscle, the likes of which you wouldn’t expect in this land of vegetarians and spirituality. 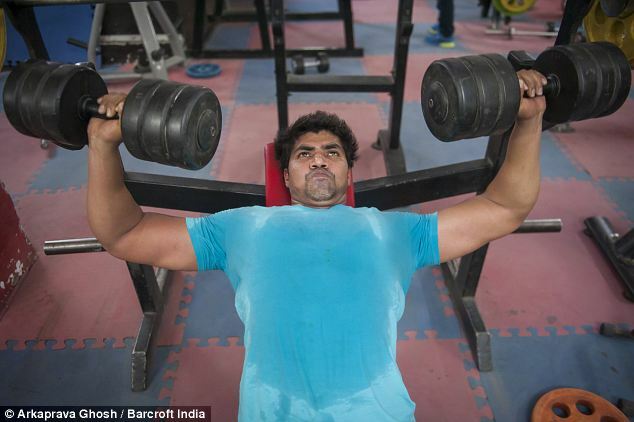 Beefy, square-jawed, arms the size of an average man’s thighs, although they are a far cry from the slim stereotype of an Indian man, these bouncers perhaps have little to outwardly distinguish them from their counterparts all over the world. It gets weird when you realise they all come from the same village – and most of them share the common surname, Tanwar. A few kilometres south, the twin urban village of Asola-Fatehpur Beri, near southern Delhi’s exclusive VIP farmhouse belt, Chhatarpur, breeds bouncers. Vijay Tanwar, head trainer at the local wrestling school, or ‘akhada’, told India Today: ‘In this village, there is not a single boy who does not go to the gym. His boasts are perhaps a bit of an exaggeration. But physical fitness has long been a way of life for the young men of Asola-Fatehpur Beri, where wrestling has always been popular. Many hoped – and still do – that their skills and strength would take them to the Olympics, or careers as professional sportsmen. But whereas most who did not would have once ended up as farmers, soaring land values around India’s capital have done for the cattle grazing land and fields of crops they once tended. Now, to make a living, for many the best option is to take up what is locally known as ‘bouncery’. More than 200 men from these villages work on the doors of the pubs, bars and nightclubs of the national capital, act as bodyguards to local dignitaries, or secure private colleges, hospitals and upmarket hotels. For them, their bodies are their livelihoods, and they spend their spare time maintaining them with long, arduous sessions in the gym and prodigious feeding sessions to provide the raw materials for muscular growth. Their efforts can earn them a good living. Employers are willing to pay as much as Rs50,000 ($835) a month for the most intimidating musclemen, in a country where the average monthly income is just $100 – and for many far less. ‘When you come up against someone twice your size, you will think twice before taking him on,’ he said. 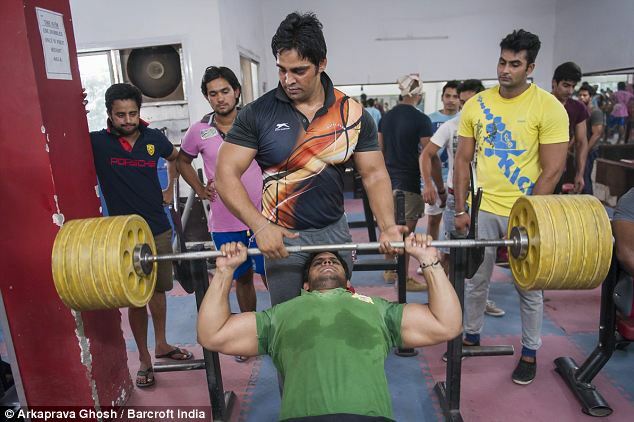 Asola’s gym, a 3,000sq/ft cement building lined with machines, racks and weights benches where the young men spend hours a day sweating and heaving for their muscles, opens at 4am and closes only at 10pm. It’s proprietor, Raj Tanwar, boasts that his boys are ‘the best in Delhi’. But becoming a bouncer is not easy. Youngsters face gruelling workout sessions lasting as long as two or three hours a day. It’s not all pumping iron, their regimens also include hours of wrestling practice and yoga, and Vijay insists that they study up to class 12 before taking up security jobs. With many among them vegetarian, they must also follow specifically mandated diets to get the protein they need to bulk up. Meat eaters can consume an entire boiled chicken, 10 egg whites, a dozen bananas, and 10 litres of milk a day. But just as the Asola-Fatehpur Beri’s fashion for security work has emerged from changes to Indian society, new trends are threatening its future. Vijay is particularly concerned about a new film which has had a bad influence on local youths. ‘Ever since they’ve seen Bhaag Milkha Bhaag, they crave sixpacks. They want to be lean,’ he sniffs. Sachin Chauhan, 22, is one of those corrupted by popular culture. He trains every day, but is also pursuing a degree in business administration at a local college. But, as he told the Calcutta Telegraph, his ambitions have little to do with balance sheets or door work. ‘I want to become a model,’ he said.